In Subsection 2.2.1 we introduced the concept of a data frame: a rectangular spreadsheet-like representation of data in R where the rows correspond to observations and the columns correspond to variables describing each observation. In Section 2.4, we started exploring our first data frame: the flights data frame included in the nycflights13 package. In Chapter 3 we created visualizations based on the data included in flights and other data frames such as weather. In Chapter 4, we learned how to wrangle data, in other words take existing data frames and transform/ modify them to suit our analysis goals. In this final chapter of the “Data Science via the tidyverse” portion of the book, we extend some of these ideas by discussing a type of data formatting called “tidy” data. You will see that having data stored in “tidy” format is about more than what the colloquial definition of the term “tidy” might suggest: having your data “neatly organized.” Instead, we define the term “tidy” in a more rigorous fashion, outlining a set of rules by which data can be stored, and the implications of these rules for analyses. Although knowledge of this type of data formatting was not necessary for our treatment of data visualization in Chapter 3 and data wrangling in Chapter 4 since all the data was already in “tidy” format, we’ll now see this format is actually essential to using the tools we covered in these two chapters. Furthermore, it will also be useful for all subsequent chapters in this book when we cover regression and statistical inference. First however, we’ll show you how to import spreadsheet data for use in R.
Let’s load all the packages needed for this chapter (this assumes you’ve already installed them). If needed, read Section 2.3 for information on how to install and load R packages. Each line in the file corresponds to one row of data/one observation. Values for each line are separated with commas. In other words, the values of different variables are separated by commas. The first line is often, but not always, a header row indicating the names of the columns/variables. An Excel .xlsx file. This format is based on Microsoft’s proprietary Excel software. As opposed to a bare-bones .csv files, .xlsx Excel files contain a lot of meta-data, or put more simply, data about the data. (Recall we saw a previous example of meta-data in Section 4.4 when adding “group structure” meta-data to a data frame by using the group_by() verb.) Some examples of spreadsheet meta-data include the use of bold and italic fonts, colored cells, different column widths, and formula macros. 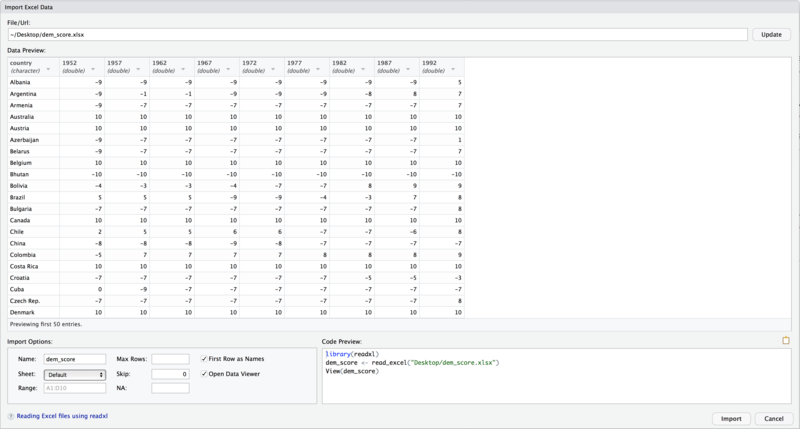 We’ll cover two methods for importing .csv and .xlsx spreadsheet data in R: one using the R console and the other using RStudio’s graphical user interface, abbreviated a GUI. In this dem_score data frame, the minimum value of -10 corresponds to a highly autocratic nation whereas a value of 10 corresponds to a highly democratic nation. We’ll revisit the dem_score data frame in a case study in the upcoming Section 5.3. Note that the read_csv() function included in the readr package is different than the read.csv() function that comes installed with R by default. While the difference in the names might seem near meaningless (an _ instead of a . ), the read_csv() function is in our opinion easier to use since it can more easily read data off the web and generally imports data at a much faster speed. Go to the Files panel of RStudio. Navigate to the directory i.e. folder on your computer where the downloaded dem_score.xlsx Excel file is saved. After clicking on the “Import” button on the bottom right RStudio, RStudio will save this spreadsheet’s data in a data frame called dem_score and display its contents in the spreadsheet viewer. Furthermore, note in the bottom right of the above image there exists a “Code Preview”: you can copy and paste this code to reload your data again later automatically instead of repeating the above manual point-and-click process. and save the resulting data frame in drinks_smaller. Using the drinks_smaller data frame, how would we create the side-by-side AKA dodged barplot in Figure 5.1? Recall we saw barplots displaying two categorical variables in Section 3.8.3. 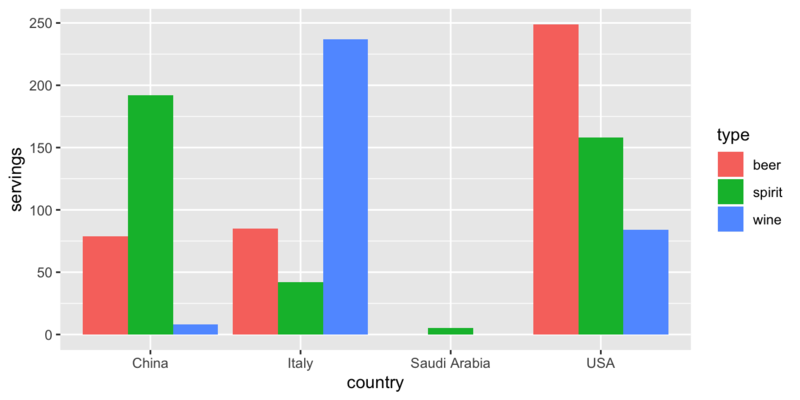 FIGURE 5.1: Alcohol consumption in 4 countries. 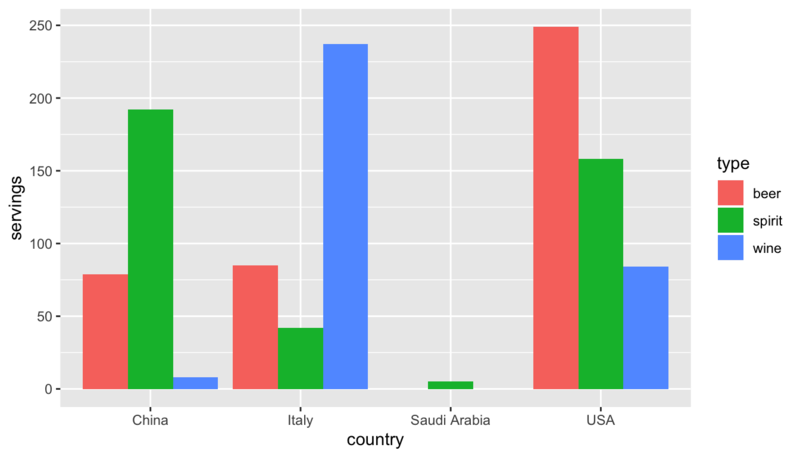 The categorical variable country with four levels (China, Italy, Saudi Arabia, USA) would have to be mapped to the x-position of the bars. The numerical variable servings would have to be mapped to the y-position of the bars, in other words the height of the bars. The categorical variable type with three levels (beer, spirit, wine) who have to be mapped to the fill color of the bars. Observe that while drinks_smaller and drinks_smaller_tidy are both rectangular in shape and contain the same 12 numerical values (3 alcohol types \(\times\) 4 countries), they are formatted differently. drinks_smaller is formatted in what’s known as “wide” format, whereas drinks_smaller_tidy is formatted in what’s known as “long/narrow”. In the context of using R, long/narrow format is also known as “tidy” format. Furthermore, in order to use the ggplot2 and dplyr packages for data visualization and data wrangling, your input data frames must be in “tidy” format. So all non-“tidy” data must be converted to “tidy” format first. Before we show you how to convert non-“tidy” data frames like drinks_smaller to “tidy” data frames like drinks_smaller_tidy, let’s go over the explicit definition of “tidy” data. Marie Kondo’s best-selling book The Life-Changing Magic of Tidying Up: The Japanese Art of Decluttering and Organizing and Netflix TV series Tidying Up with Marie Kondo. A dataset is a collection of values, usually either numbers (if quantitative) or strings AKA text data (if qualitative). Values are organised in two ways. Every value belongs to a variable and an observation. A variable contains all values that measure the same underlying attribute (like height, temperature, duration) across units. An observation contains all values measured on the same unit (like a person, or a day, or a city) across attributes. 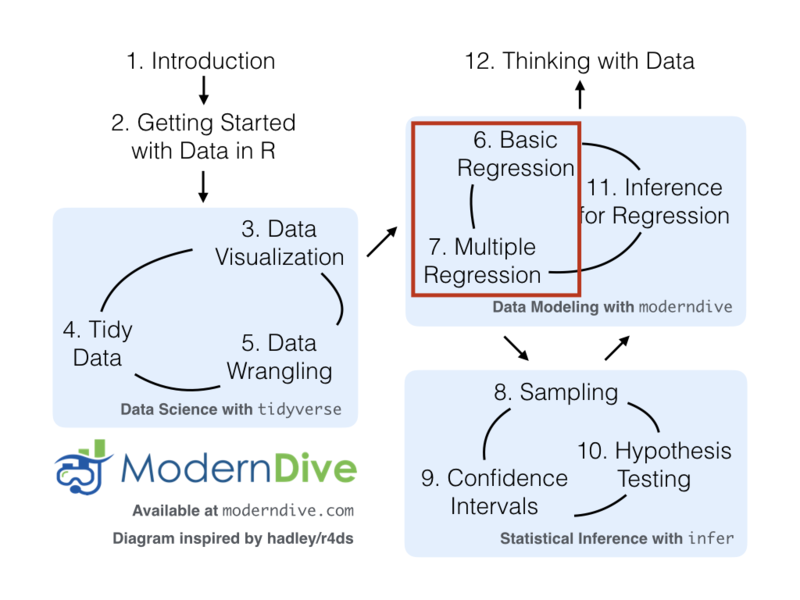 FIGURE 5.2: Tidy data graphic from R for Data Science. Although the data are neatly organized in a rectangular spreadsheet-type format, they are not in tidy format because while there are three variables corresponding to three unique pieces of information (Date, Stock Name, and Stock Price), there are not three columns. In “tidy” data format each variable should be its own column, as shown in Table 5.2. Notice that both tables present the same information, but in different formats. Now we have the requisite three columns Date, Stock Name, and Stock Price. On the other hand, consider the data in Table 5.3. In this case, even though the variable “Boeing Price” occurs just like in our non-“tidy” data in Table 5.1, the data is “tidy” since there are three variables corresponding to three unique pieces of information: Date, Boeing stock price, and the weather that particular day. (LC5.1) What are common characteristics of “tidy” data frames? (LC5.2) What makes “tidy” data frames useful for organizing data? In this book so far, you’ve only seen data frames that were already in “tidy” format. Furthermore for the rest of this book, you’ll mostly only see data frames that are already in “tidy” format as well. This is not always the case however with data in the wild. If your original data frame is in wide i.e. non-“tidy” format and you would like to use the ggplot2 package for data visualization or the dplyr package for data wrangling, you will first have to convert it “tidy” format using the gather() function in the tidyr package (Wickham and Henry 2019). key is the name of the column/variable in the new “tidy” frame that contains the column names of the original data frame that you want to tidy. Observe how we set key = type and in the resulting drinks_smaller_tidy the column type contains the three types of alcohol beer, spirit, and wine. value is the name of the column/variable in the “tidy” frame that contains the rows and columns of values in the original data frame you want to tidy. Observe how we set value = servings and in the resulting drinks_smaller_tidy the column value contains the 4 \(\times\) 3 = 12 numerical values. The third argument are the columns you either want to or don’t want to tidy. Observe how we set this to -country indicating that we don’t want to tidy the country variable in drinks_smaller and rather only beer, spirit, and wine. The third argument is a little nuanced, so let’s consider another example. Note the code below is very similar, but now the third argument species which columns we’d want to tidy c(beer, spirit, wine), instead of the columns we don’t want to tidy -country. Note the use of c() to create a vector of the columns in drinks_smaller that we’d like to tidy. If you run the code below, you’ll see that the resulting drinks_smaller_tidy is the same. With our drinks_smaller_tidy “tidy” format data frame, we can now produce a side-by-side AKA dodged barplot using geom_col() and not geom_bar(), since we would like to map the servings variable to the y-aesthetic of the bars. Converting “wide” format data to “tidy” format often confuses new R users. The only way to learn to get comfortable with the gather() function is with practice, practice, and more practice. For example, see the examples in the bottom of the help file for gather() by running ?gather. We’ll show another example of using gather() to convert a “wide” formatted data frame to “tidy” format in Section 5.3. For other examples of converting a dataset into “tidy” format, check out the different functions available for data tidying and a case study using data from the World Health Organization in R for Data Science (Grolemund and Wickham 2016). This data frame is not in “tidy” format. How would you convert this data frame to be in “tidy” format, in particular so that it has a variable incident_type_years indicating the incident type/year and a variable count of the counts? Recall the nycflights13 package with data about all domestic flights departing from New York City in 2013 that we introduced in Section 2.4 and used extensively in Chapter 3 on data visualization and Chapter 4 on data wrangling. Let’s revisit the flights data frame by running View(flights). We saw that flights has a rectangular shape with each of its 336,776 rows corresponding to a flight and each of its 22 columns corresponding to different characteristics/measurements of each flight. This matches exactly with our definition of “tidy” data from above. But what about the third property of “tidy” data? airlines: translation between two letter IATA carrier codes and names (16 in total). i.e. the observational unit is an airline company. planes: construction information about each of 3,322 planes used. i.e. the observational unit is an aircraft. weather: hourly meteorological data (about 8705 observations) for each of the three NYC airports. i.e. the observational unit is an hourly measurement. airports: airport names and locations. i.e. the observational unit is an airport. In this section, we’ll show you another example of how to convert a data frame that isn’t in “tidy” format i.e. “wide” format, to a data frame that is in “tidy” format i.e. “long/narrow” format. We’ll do this using the gather() function from the tidyr package again. Furthermore, we’ll make use of some of the ggplot2 data visualization and dplyr data wrangling tools you learned in Chapters 3 and 4. Let’s use the dem_score data frame we imported in Section 5.1, but focus on only data corresponding to Guatemala. 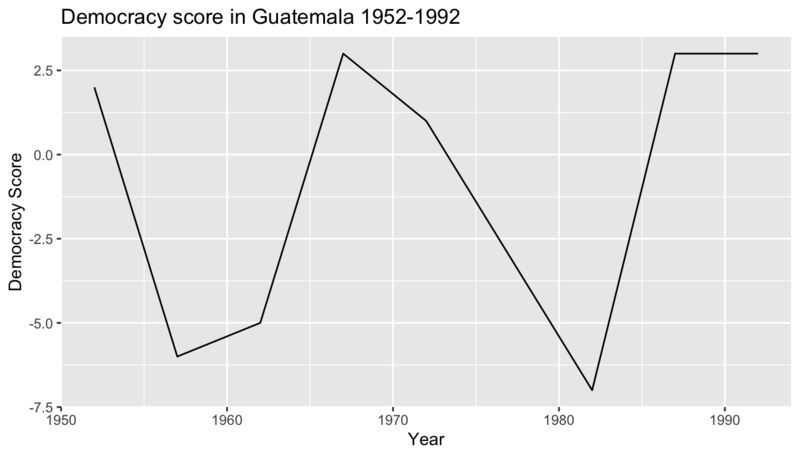 Now let’s produce a time-series plot showing how the democracy scores have changed over the 40 years from 1952 to 1992 for Guatemala. Recall that we saw time-series plot in Section 3.4 on creating linegraphs using geom_line(). Let’s lay out the Grammar of Graphics we saw in Section 3.1. Now we are stuck in a predicament, much like with our drinks_smaller example in Section 5.2. We see that we have a variable named country, but its only value is "Guatemala". We have other variables denoted by different year values. Unfortunately, the guat_dem data frame is not “tidy” and hence is not in the appropriate format to apply the Grammar of Graphics and thus we cannot use the ggplot2 package. We need to take the values of the columns corresponding to years in guat_dem and convert them into a new “key” variable called year. Furthermore, we’d like to take the democracy scores on the inside of the table and turn them into a new “value” variable called democracy_score. Our resulting data frame will thus have three columns: country, year, and democracy_score. key is the name of the column/variable in the new “tidy” frame that contains the column names of the original data frame that you want to tidy. Observe how we set key = year and in the resulting guat_dem_tidy the column year contains the years where the Guatemala’s democracy score were measured. value is the name of the column/variable in the “tidy” frame that contains the rows and columns of values in the original data frame you want to tidy. Observe how we set value = democracy_score and in the resulting guat_dem_tidy the column democracy_score contains the 1 \(\times\) 9 = 9 democracy scores. The third argument are the columns you either want to or don’t want to tidy. Observe how we set this to -country indicating that we don’t want to tidy the country variable in guat_dem and rather only 1952 through 1992. However, observe in the output for guat_dem_tidy that the year variable is of type chr or character. Before we can plot this variable on the x-axis, we need to convert it into a numerical variable using the as.numeric() function within the mutate() function, which we saw in Section 4.5 on mutating existing variables to create new ones. (LC5.4) Convert the dem_score data frame into a tidy data frame and assign the name of dem_score_tidy to the resulting long-formatted data frame. (LC5.5) Read in the life expectancy data stored at https://moderndive.com/data/le_mess.csv and convert it to a tidy data frame. You’ve seen the first 4 of the these packages: ggplot2 for data visualization, dplyr for data wrangling, tidyr for converting data to “tidy” format, and readr for importing spreadsheet data into R. The remaining packages (purrr, tibble, stringr, and forcats) are left for a more advanced book; check out R for Data Science to learn about these packages. The tidyverse “umbrella” package gets its name from the fact that all functions in all its constituent packages are designed to that all inputs/argument data frames are in “tidy” format and all output data frames are in “tidy” format as well. This standardization of input and output data frames makes transitions between the various functions in these packages as seamless as possible. An R script file of all R code used in this chapter is available here. If you want to learn more about using the readr and tidyr package, we suggest you that you check out RStudio’s “Data Import” cheatsheet. 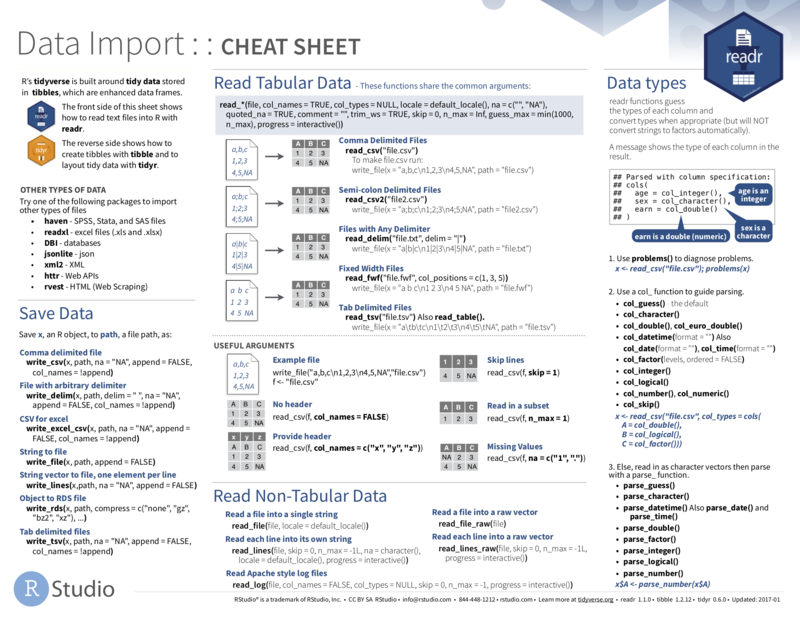 You can access this cheatsheet by going to RStudio’s cheatsheet page and searching for “Data Import Cheat Sheet”. Congratulations! We’ve completed the “Data Science via the tidyverse” portion of this book! We’ll now move to the “data modeling” portion in Chapters 6 and 7, where you’ll leverage your data visualization and wrangling skills to model relationships between different variables in data frames. However, we’re going to leave the Chapter 11 on “Inference for Regression” until after we’ve covered statistical inference. FIGURE 5.4: ModernDive flowchart - On to Part II! Wickham, Hadley. 2014. “Tidy Data.” Journal of Statistical Software Volume 59 (Issue 10). https://www.jstatsoft.org/index.php/jss/article/view/v059i10/v59i10.pdf. Wickham, Hadley, and Lionel Henry. 2019. Tidyr: Easily Tidy Data with ’Spread()’ and ’Gather()’ Functions. https://CRAN.R-project.org/package=tidyr. Wickham, Hadley. 2018. Nycflights13: Flights That Departed Nyc in 2013. https://CRAN.R-project.org/package=nycflights13.